Good. 0310210860 Mild to moderate shelf/reading wear. Binding good. HAS UNDERLINING, HIGHLIGHTING, AND/OR MARGIN NOTES THROUGHOUT. Orphans Treasure Box sells books to raise money for orphans and vulnerable kids. New. 0310210860 BRAND NEW! ! MULTIPLE COPIES AVAILABLE. NEW CONDITION! ! 100% MONEY BACK GUARANTEE! ! BUY WITH CONFIDENCE! WE SHIP DAILY! ! EXPEDITED SHIPPING AVAILABLE. Why do the books of Samuel pack such broad appeal? Taken together as a single narrative, they certainly offer something for everyone: kings and prophets, great battles and greater heroes, action and romance, loyalty and betrayal, the mundane and the miraculous. In Samuel, we meet Saul, David, Goliath, Jonathan, Bathsheba, the witch of Endor, and other unforgettable characters. And we encounter ourselves. For while the culture and conditions of Israel under its first kings is vastly different from our own, the basic issues of humans in relation to God, the Great King, have not changed. Sin, repentance, forgiveness, adversity, prayer, faith, and the promises of God---these continue to play out in our lives today. Exploring the links between the Bible and our own times, Bill T. Arnold shares perspectives on 1 and 2 Samuel that reveal ageless truths for our twenty-first-century lives. Most Bible commentaries take us on a one-way trip from our world to the world of the Bible. But they leave us there, assuming that we can somehow make the return journey on our own. They focus on the original meaning of the passage but don't discuss its contemporary application. The information they offer is valuable---but the job is only half done! 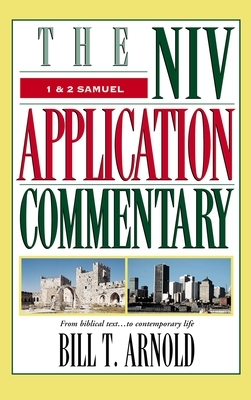 The NIV Application Commentary Series helps bring both halves of the interpretive task together. This unique, award-winning series shows readers how to bring an ancient message into our postmodern context. It explains not only what the Bible meant but also how it speaks powerfully today. New. Sewn binding. Cloth over boards. With thumb index. 688 p. NIV Application Commentary, 19.
by Dr. Karen H Jobes, Ph.D.